TWINS - That Which Is Not Said. Vinyl LP, CD. Bleep. Atlanta home-taper TWINS has hewn his new full-length, That Which Is Not Said, over the course of two years. Holed up in his home studio, Matthew Weiner laboured over his array of synths, samplers and drum machines in order to whittle down initial sonic experiments into the well-structured synthwave numbers that make up this LP. 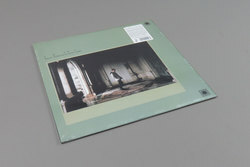 That Which Is Not Said - the phrase that TWINS stands for, making this the closest Weiner has come to releasing an eponymous record - channels the likes of Bauhaus, Boy Harsher and the Italians Do It Better roster. The result is eight vampy, Gothic tracks you can still get loose to.